Want to Learn More About Die Singulation? Die singulation is the process of isolating individual IC’s from a wafer. There are a variety of methods for die singulation with the most common being conventional dicing, laser dicing, scribe and break, and dice before grind (DBG). Conventional dicing is the current industry standard for die singulation. Conventional dicing typically utilizes diamond enriched resin-bonded blades on high precision saws to cut through materials like silicon, alumina nitride, sapphire, gallium nitride, and mold compound. dicing. A blade mounted on a high speed spindle cuts the material while high pressure water nozzles flood the work piece and blade to provide cooling. Standard dicing feed rates range from 0.5 to 3.0 inches per second depending on the material, material thickness, and quality requirements. The chilled deionized water used during dicing provides lubrication to remove particles generated during saw. Re-ionized water can be used instead of deionized water to lower resistivity and minimize ESD effects on ESD sensitive products. Surfactant can also be added to the process water for ESD purposes, additional lubrication, and to minimize corrosion in copper embedded bond pads. The blades used in conventional dicing vary in size depending on the material thickness and saw street width. The saw street is the distance between the outer edge of each die on a wafer. As the blade cuts through the material a saw kerf is generated. The kerf includes the extra material removed in addition to the blade width. The saw kerf is typically an additional 10-20µm wider than the actual blade width. On a 40µm wide blade, for example, the actual material removed, or kerf, would be 60µm. As a result, blade selection is highly dependent upon street width. Material thickness also plays a critical role in blade selection. With thick materials wide blades are a necessity in order to provide adequate blade strength to cut through more material. Additionally, the dicing blade edge requires an adequate clearance and engagement area to effectively cut. The clearance required for a blade is called the blade exposure. A tall skinny blade is more unstable and prone to blade wobble and breakage when cutting thick materials. Therefore, material thickness and sufficient exposure is another key variable in blade selection. As a rule of thumb, the thicker the material the wider the blade needed, the taller the exposure and, in turn, the wider the required street width. With conventional dicing, chipping is the main quality concern. Chipping quality is governed by feed rate, cut mode, blade width, blade concentration, and blade grit. Typically, the higher the feed rate the larger the chipping. Two different cut modes are typically used, step cut and single pass. Single pass uses one blade to cut all the way through the material. 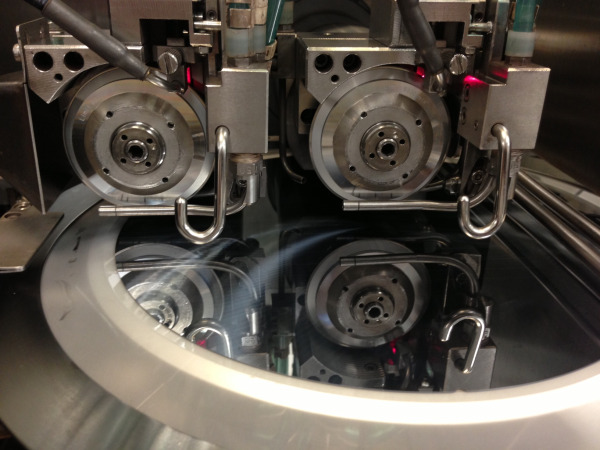 Step cut uses two blades to cut at different depths in the wafer. Single pass provides greater throughput, but larger chipping compared to step cut. Blade grit and concentration are selected based on whether topside or backside chipping is critical and whether metal peeling or chipping is of concern.